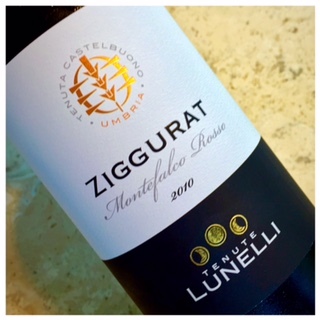 My husband asked me to make Bolognese sauce with pasta the other day so I took the opportunity to open this bottle of Tenute Lunelli Ziggurat Montefalco Rosso 2010* that I just received. While the most prominent reds of Umbria are labeled Montefalco Sagrantino DOCG and are made from 100% Sagrantino grapes, the easier drinking Montefalco Rosso DOC wines are made from a blend of grapes with food-friendly Sangiovese being one of the main components. The Tenute Lunelli Ziggurat Montefalco Rosso 2010 contains 70% Sangiovese, 15% Sagrantino and 15% Cabernet and Merlot sourced from the family owned vineyards in Montefalco and Bevagna. This wine spent 12 months aging in barrel and 6 months in the bottle before it was released. 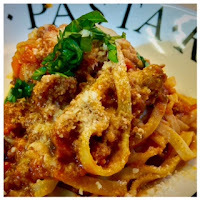 The high percentage of Sangiovese makes it a classic pairing with pasta and tomato based sauce while the addition of the Sagrantino and the other international varieties makes the wine even more meat friendly. We enjoyed it with our simple week night meal of salad, bread and pasta with meat sauce. It was a bright ruby red in the glass with aromas of ripe cherries and raspberries with a bit of Chinese 5-spice. It was dry with moderate tannins and good acidity with fresh cherry/berry flavors and a long, lightly spiced finish. Balanced, easy-drinking and casually elegant, we loved it! This wine is priced at approximately $13; it is highly recommended and I will be seeking out more. *I received this bottle as a media sample from the Consorzio Montefalco.